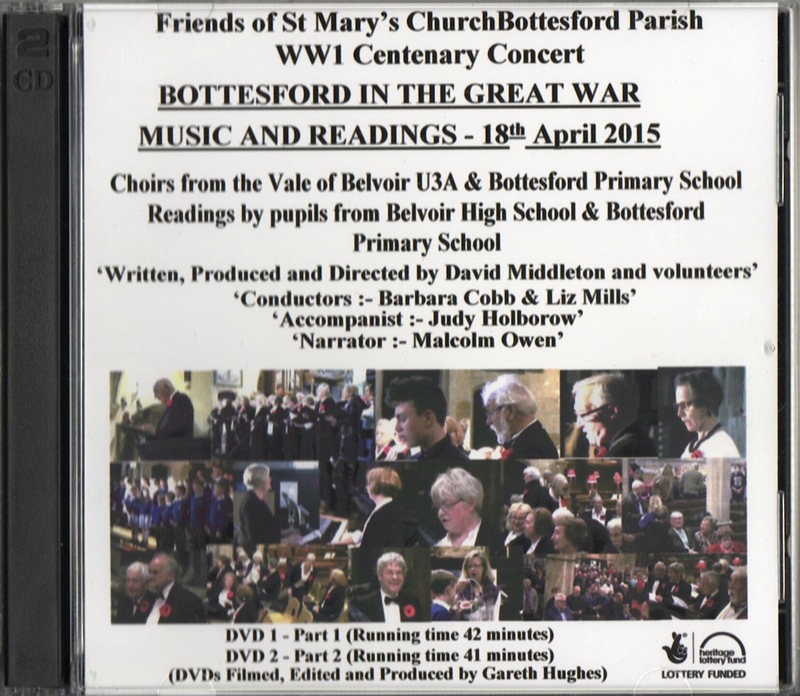 As part of the ‘Bottesford in the Great War Heritage Weekend’ the Friends of St Mary’s and the Bottesford Parish Centenary Project organised and produced a well-attended concert of music and readings on Saturday 18th April 2015 in St Mary’s Church, Bottesford. 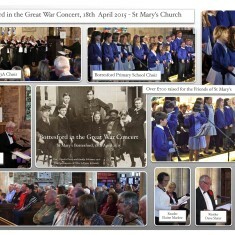 Music and readings told the story and illustrated the impact of the 1st World war on the community. 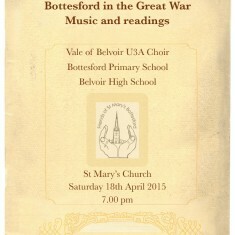 Music of the period was performed by the Vale of Belvoir U3A Choir and conducted by Barbara Cobb. 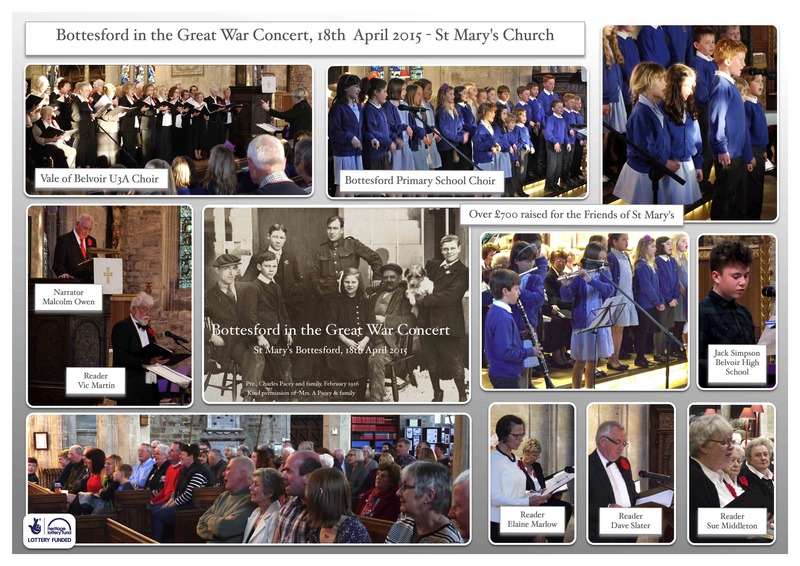 The Primary School Choir, conducted by Liz Mills, performed WW1 songs and very well received musical items reflecting the sentiments of the period. 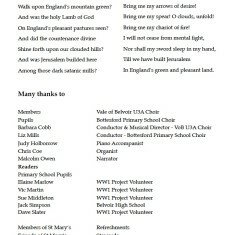 Judy Holborow accompanied both choirs on the piano. Malcolm Owen was the narrator for the evening. Readings selected from the Grantham Journal and the School Log from the period were read by Primary School children, Jack Simpson (from Belvoir High School), Vic Martin, Dave Slater, Elaine Marlow and Sue Middleton. 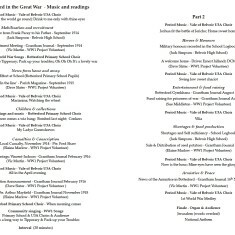 Both the exhibition and concert received excellent audience comments, especially in the way they brought the community together in providing a ‘moving tribute and reminder of the brave sacrifice made by so many’. 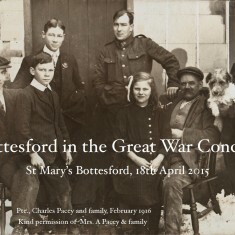 The Concert raised over £700 for the Friends of St Mary’s. 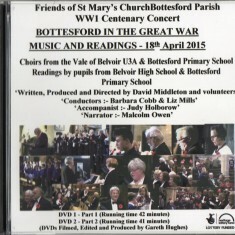 A DVD of the whole event was kindly recorded and produced by Gareth Hughes. 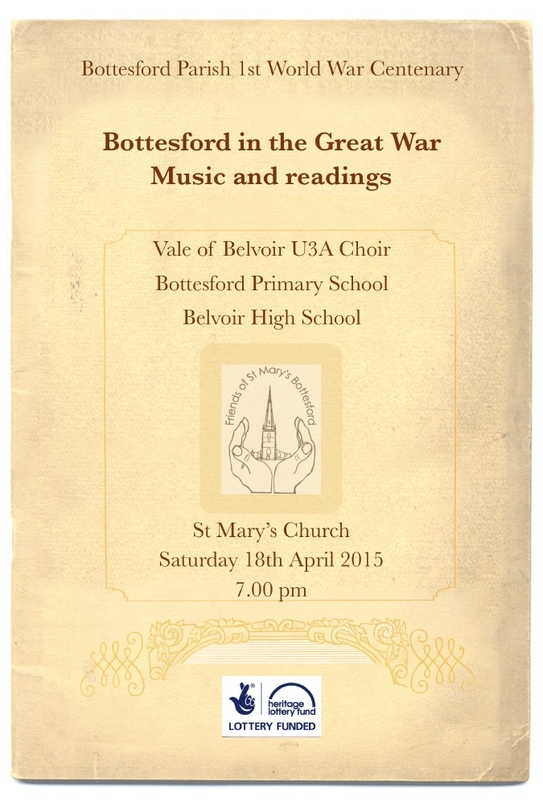 Vale of Belvoir U3A Choir. 1) It's love that makes the world go round. 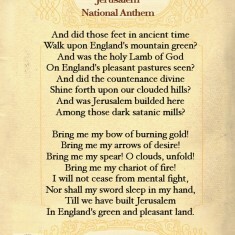 2) Drink to me only with thine eyes. 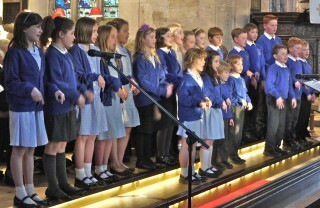 Bottesford Primary School Choir. 'Pack up your troubles in your old kit bag'. 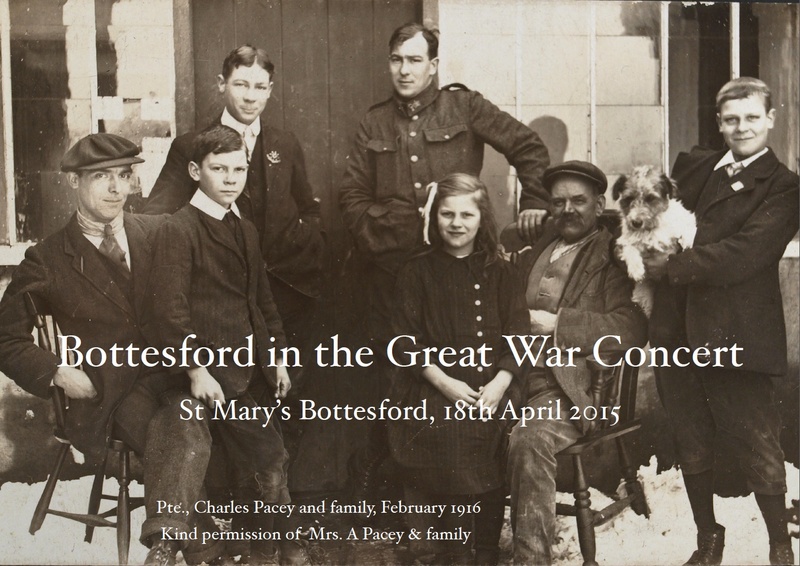 Before the declaration of War on the 4th August 1914 Bottesford life appeared untouched by the world at large and the unfolding international crisis. 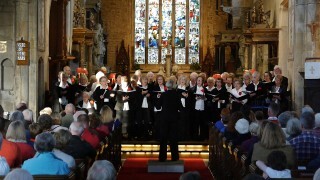 The Grantham Journal reported regular Concerts and events. 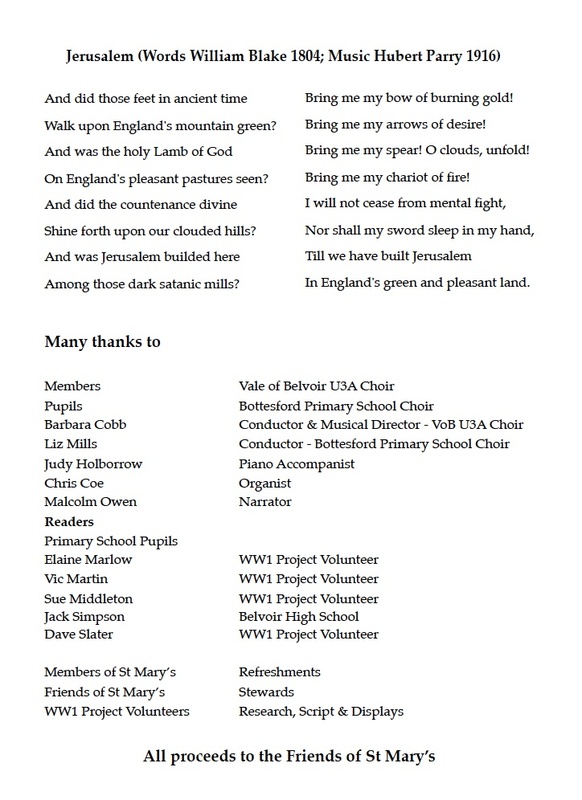 The Choral Society and Brass Band featured along side numerous whist drives, Cricket and Tennis dances, pig and angling club suppers and Church and Chapel fund raisers. 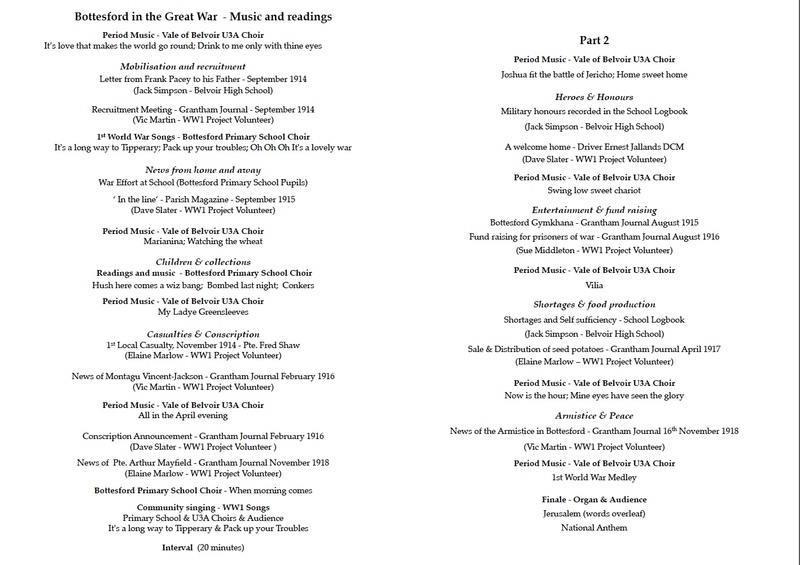 Music and song mustered men and boosted morale at home and on active service. 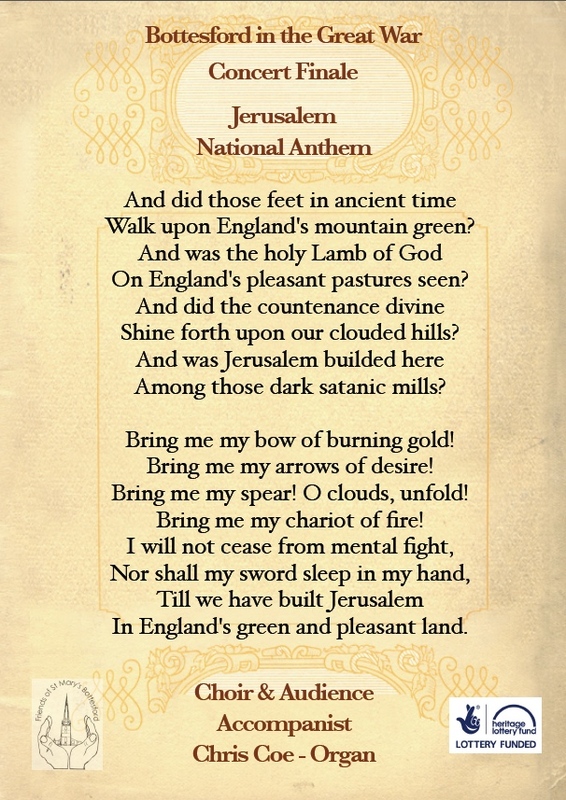 Welcome to the Primary School Choir who will now sing a selection of WW1 songs. This page was added on 15/05/2015.